Welcome to our HRXE range of high performance Mechanical Ventilation with Heat Recovery (MVHR) units for small to medium size residential properties. We’re proud to say that the HRXE units show even greater efficiency through advanced heat exchange proficiency and low Specific Fan Power (SFP). When used with a kitchen and one wet room, at typical installation, the HRXE provides a 90% heat exchange performance and boasts a very low SFP down to 0.57 (W/l/s). The new HRXE range is not only efficient, but also exceptionally quiet, with background (normal) ventilation at 24dBA (typically whisper quiet). Noise reduction can be further reduced through the use of an Anti-Vibration tray HRXE-AV, which isolates the unit from the wall to reduce any low levels of vibration induced noise which can be distracting to residents. There are four models in the HRXE range, all with a two year warranty and all featuring 100% Automatic Bypass which automatically activates when the air temperature reaches a pre-set level, allowing in cooler, fresh, filtered air without warming it through the heat exchanger. The smart design of the HRXE means there is no reduction in airflow when operating in bypass mode. Two of the HRXE models are also available with integral humidity sensors, HRXE-H and HRXE-OPH. By accurately measuring air humidity, the HRXE’s extract speed automatically changes from background to boost as the level of humidity increases, thereby providing optimal ventilation performance. 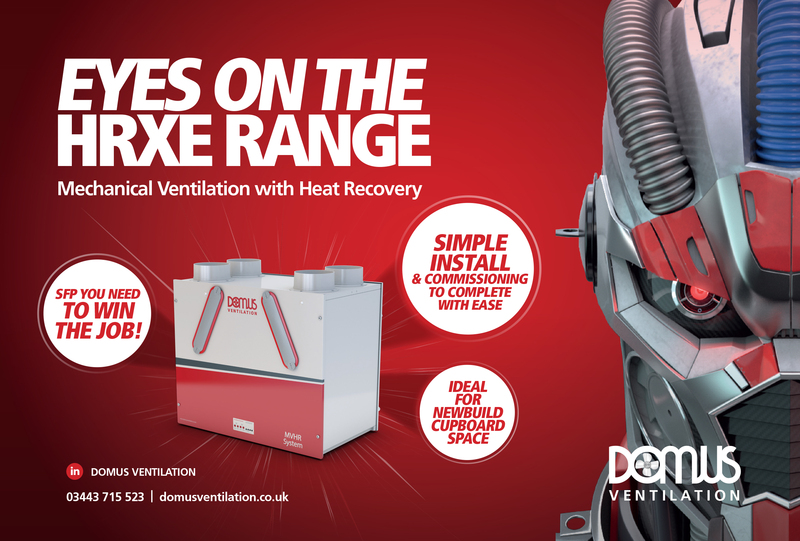 When it comes to installation, Domus Ventilation has designed the HRXE units to be even smaller than their predecessors making them ideal for wall-mounted cupboard installation as well as offsite pre-fabrication builds which are proving increasingly popular within the New Build sector. There are also opposite handed models available to meet different on-site requirements. Spigots on the top of the HRXE are 125mm, but with Domus Ventilation’s extensive duct portfolio, adaptors are available to enable direct connection to the most common ducting size - 204x600mm flat channel duct –for quicker and more cost-effective installation. Furthermore, integrated controls are accessed via a front panel for easy commissioning. The HRXE range has been designed to work most efficiently when used with Domus duct systems, including its Flow Control Plenum and High Efficiency Green Line Bends, which reduce duct bend resistance by up to 60%. Domus duct systems offer improved system performance through the exacting tolerances and engineered fit of the system, whereby pressure drops are minimised and air leakage virtually eliminated. To see the full product spec click here.